There is surely no more permanent a way of declaring your undying love for someone than by having it branded on to your skin in tattoo ink. Unless, of course, you do so in a foreign language so badly translated from the English that the original sentiment is rendered embarrassingly nonsensical. Anyone tempted to enlist the services of a tattoo artist is now being warned by a professional translation service to “Think Before You Ink” and use professional spell checks and translations to avoid ending up with misspellt, meaningless or just plain ridiculous words or phrases erroneously inked on to their body. Among examples of the problem cited by Veritas Language Solutions is a man who wanted the Chinese symbols for "Live and let live" on his arm but ended up with the Mandarin for "Sweet and Sour Chicken". 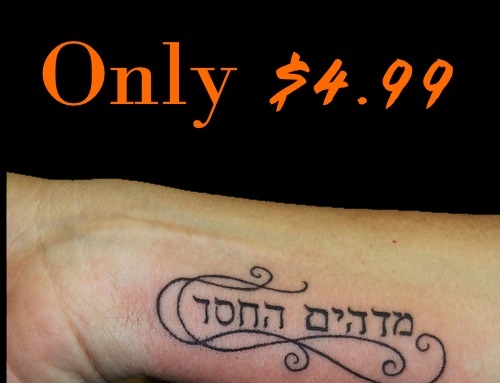 A woman who used an internet translation tool to render “I love David” into Hebrew later discovered she had inadvertently had the phrase “Babylon is the world's leading dictionary and translation software" inked on to her back. In another example, a young man was ironically left with the word “Jenius” branded on his forehead, while a woman who wanted her favourite flower name scrawled across her lower back was left with the words "Sweet Pee" above her waistline. Sharon Stephens, managing director of the translation service, said: "Tattoo translations are in demand and we regularly get requests for Chinese, Arabic and Hebrew and, now and again, Gaelic. Problems arise when literal translations are used instead of finding out what the equivalent word or phrase in the foreign language is. "The translator's task should be to translate the text into the equivalent in the other language,” Ms Stephens said. "However, equivalent does not mean literal translation, which is what happens a lot of the time and could be catastrophic for the person having the tattoo. "We encourage people thinking about getting inked to get their tattoo translation checked before proceeding any further." Another category of mistakes are attributable simply to bad use of English grammar and spelling. Ms Stephens said: “We have seen tattoos like "Life go's on'", "It's get better" and "Streangth". Among the most famous body ink fans to fall foul of the advice about checking translations is David Beckham, the footballer, who reportedly decided to have his wife Victoria’s name tattooed on his left arm in Hindi script because he felt it would look less “tacky” than having it in English. Unfortunately for him, an extra ‘h’ was wrongly added into Victoria’s name, leaving the word “Vihctoria” branded on his skin. Jerri Peterson, from Atlanta in the US, paid $10 (£6.40) to have the words “Olympic Torch Bearer” inked on to her arm before she carried the flame through Derby. The error was only pointed out to her when she sent her friend a picture of her new body art.